Move beyond fragmented and hard-to-use document control and quality management systems that leave you feeling frustrated and uncertain. QualityOne is the complete, easy-to-use document control and quality management application. 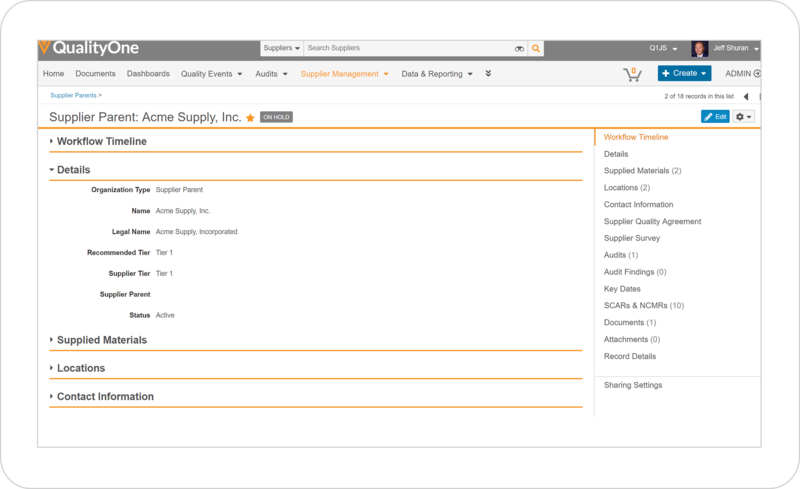 With QualityOne, you can manage quality processes, document control, and data in a single application for employees, suppliers, contract manufacturers, and auditors. Click any of the links below to learn more about how we approach key quality processes. QualityOne's document control solution enables employees and partners to author, collaboratively review, approve, and release documents. An efficient document control process is an essential part of compliance requirements in regulated industries subject to GxP and ISO standards. QualityOne document control allows users to easily and securely access the most current version of any document and automatically collects audit trail information. Seamless integration with Microsoft Office Online allows for real-time collaborative authoring, reducing review cycles and implementing changes faster. QualityOne enables more effective management of nonconformance and investigation. Easily execute an investigation and root cause analysis to stay on top of quality and compliance requirements. Nonconformance may include departures from standard practices or specifications that result in non-conforming material or processes. "Veeva gives us a modern quality system to achieve greater efficiency while maintaining compliance. 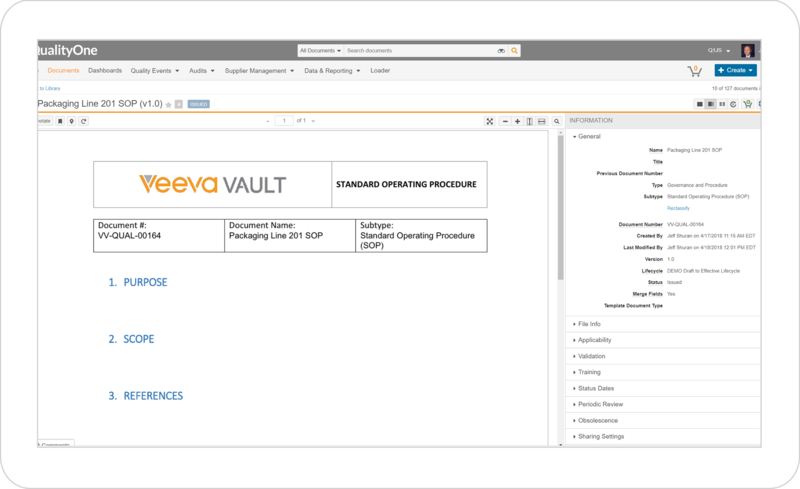 With Veeva QualityOne, users log-in to one cloud-based system, regardless of location, to review content, make changes, or do approvals. Processes that used to take weeks can now be done in a matter of days." QualityOne's complaint management solution enables organizations to quickly and accurately process complaints coming from their most valuable assets - customers. 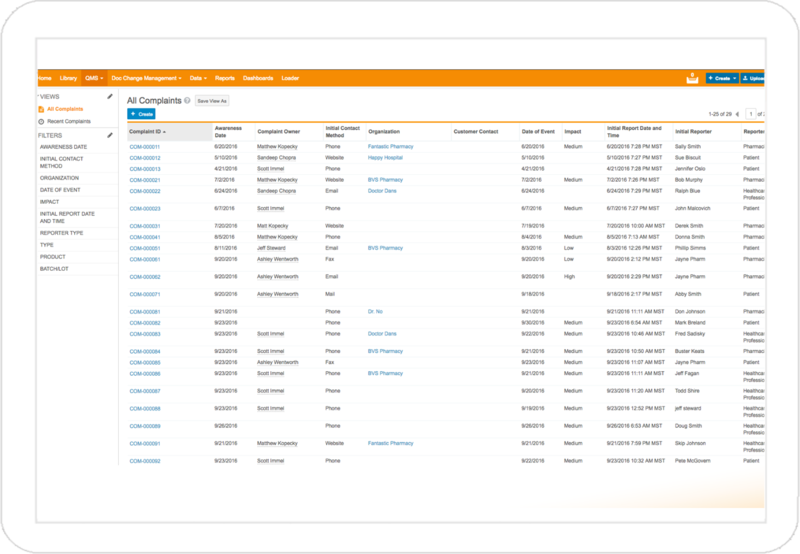 Through this complete quality application, complaints can be linked to product data and related QMS processes, like CAPA, ensuring comprehensive issue resolution and completion of corrective actions. 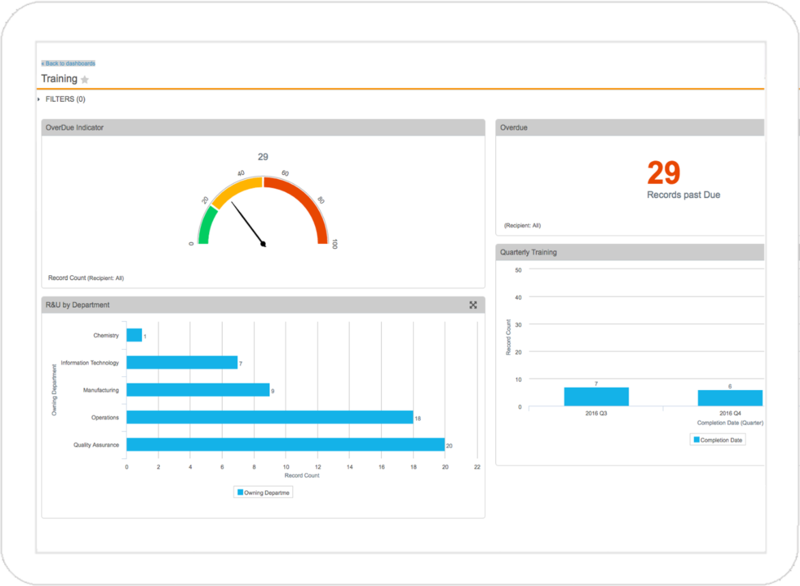 Real-time dashboards enable immediate identification of trends that facilitate prompt response to emerging customer and product issues, allowing your organization to stay ahead. QualityOne's CAPA management solution empowers your organization to effectively and efficiently manage and resolve nonconformances. Regardless of where issues arise, our complete quality solution allows for seamless linkages to quality processes such as customer complaints, audits, and change control, which saves time and reduces risk. Issues can be quickly contained and thoroughly investigated through a robust CAPA management solution that supports your process. Implementation of planned actions based on the root cause analysis can be assigned, tracked to completion, and checked for effectiveness - all in one system. Additionally, real-time dashboards allow for management oversight of the process and facilitate early detection to address systemic issues. Using this comprehensive CAPA management solution, your team can more effectively prevent recurrence of nonconformances. QualityOne's change control solution effectively manages all product and process changes in one complete, easy-to-use application. Capture change requests from across the business and engage the right subject matter experts in the impact assessment all in one place. 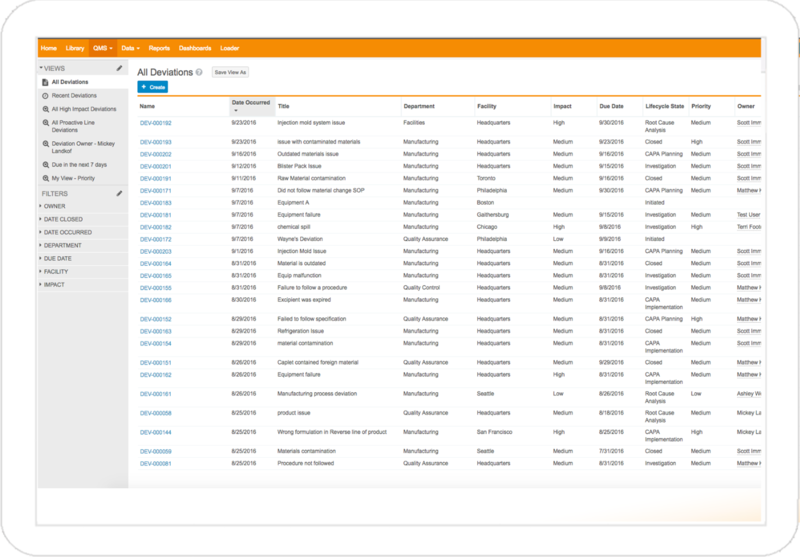 Through our complete application, users can assign actions, link them to required documents, and track them to completion, ensuring an effective process. 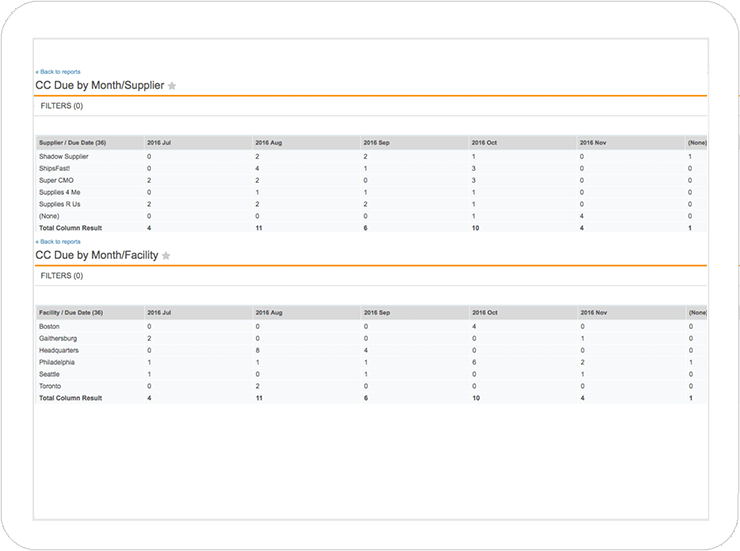 Customized dashboards pull from document status and planned actions to instantly show the status of any or all change controls. 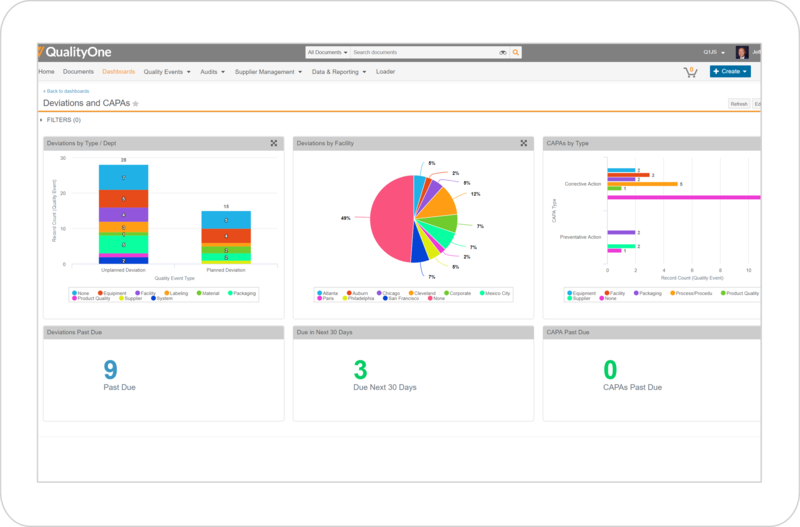 QualityOne provides a best practice end-to-end audit management application, connecting all internal and external parties in one complete application. 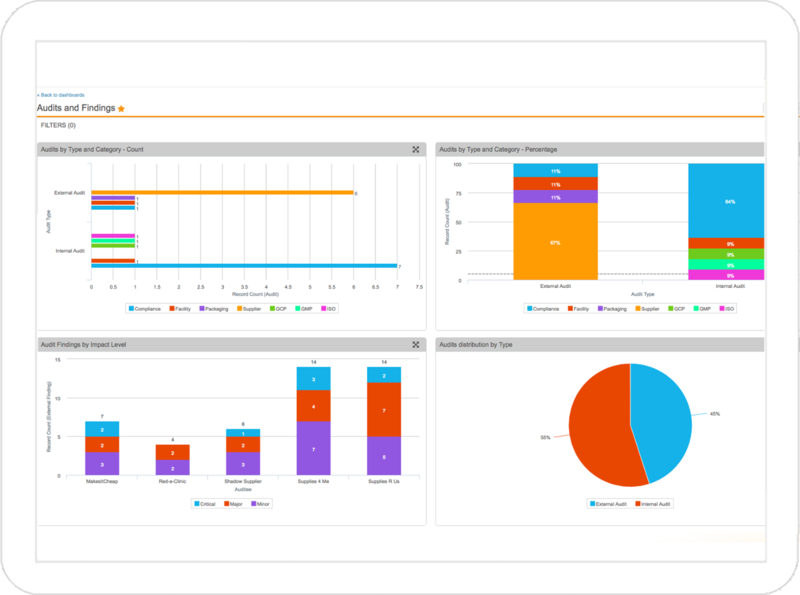 Originating at audit planning and scheduling, track and manage across the full continuum of the audit process. Maintain and utilize all supporting audit materials and checklists within the application. Upon completion of the audit, manage issuance of audit findings and corrective actions completion through the seamless linkage to the CAPA process. QualityOne also provides secure and limited access to suppliers and other partners, enabling them to respond directly to audit findings and reducing manual and redundant efforts. QualityOne's supplier quality management (SQM) solution can transform your supplier relationships into partnerships dedicated to improving quality, ensuring ongoing compliance, and reducing risk. QualityOne facilitates this shift by enabling all parties, internal or external, to work together through supplier certifications, audits, corrective actions, and performance monitoring on the same application. Accessing the same data increases supplier accountability and improves collaboration and speed. QualityOne document training management features enable employees to complete training and maintain training records in accordance with internal policies and external regulations and standards. This complete application connects the quality management system with training for document revisions, change control, and other quality processes. Automated assignments, reminders, and escalation features ensure that employees are always up to date with training requirements, eliminating manual administrative efforts. The QualityOne document training management solution can also be extended to include external stakeholders that are part of your business processes. 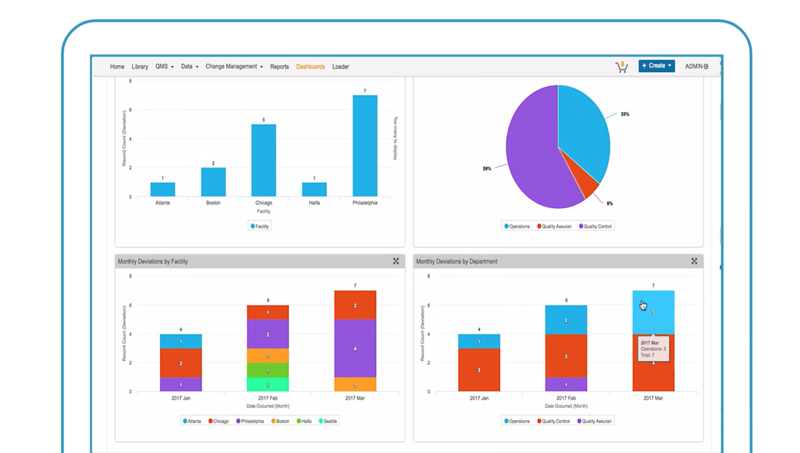 Ready to explore how Veeva can help you transform quality in your organization?